Some men love their beard; on the contrary there are many others who do not like it just because it is not thick, well set and stylish. It is maybe due to some medical condition, genetic problem, surgery, scare or burns the beard may not grow as it should be; but with beard transplant in London UK, will help you provide a technique with which you can grow your beard naturally and can set it with the style which you want. Prior appointments are given where our team of professionals will consult and provide you with information about the beard transplant. We also will let you know with pros and cons of such transplant and what precautions need to be taken. Moreover, we also provide them with second opinion if they feel to take it from any other surgeons at our end or from outside. The Follicular Unit Extraction (FUE) procedure requires minimal invasive procedure to restore the hair in the area where they are not growing properly. Usually it may take 3 to 9 hours depending on the amount of hair to be transplanted in affected areas of beard. During Beard transplant surgeons will find for the donor area from that side or back of the scalp. In case of patients who are bald for them body hair are also been a good candidate in providing good looking and thick beard. Moreover, once the beard is transplanted after that the hair which is transplanted in affected area will start growing like normal hair which can be trimmed or shaved as per your usual routine. With Follicle Unit Extraction technique, the result will be permanent and will give natural look. Moreover, the result will be noticeable immediately after the procedure completed. Rest is not needed much when you undergo the bread transplant surgery, you can start with your daily routines immediately and the best part of this Beard transplant surgery in US is it gives immediate result. Moreover, the comprehensive care needs to be taken care that you should avoid contact of sweating at the areas where you are been treated in order to avoid risk of infection. Like other surgery there are no major risk under this FUE Beard transplant surgery but some minor risk are there, for which our team will guide you on. The pre and post surgery information will be shared with you and none of our team member will force you to undergo with the surgery, the decision for going under surgery will be solely kept on you. 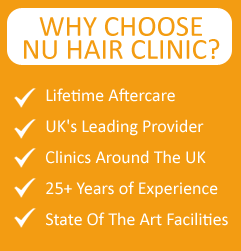 Moreover our Nu Hair clinic in US will also provide you with comprehensive guide to take home and go through the same and then take the wise decision. Mr Smith’s wife love man with beard, but Mr Smith was not getting the beard which she was looking for. He was getting thin beard with not having hair at various locations on face which was making the appearance dull at many times. So he approaches us and our surgeon at Nu Hair clinic in US operated him with FUE Procedure for Beard transplant which give him immediate result and he surprise her wife with the same.